Before I start, let me explain that I have lots of free time these days as I'm on summer vacation. 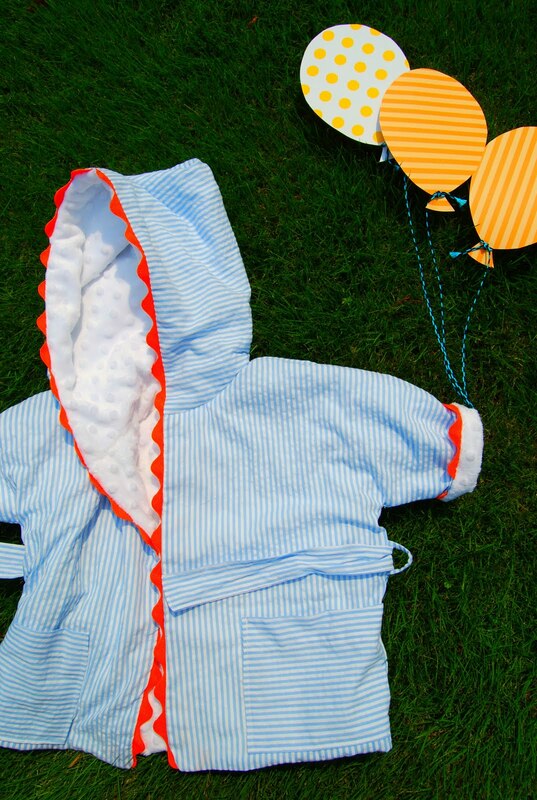 Hence the paper balloons and posed bathrobe photo shoot in the front yard. My neighbors must think I'm crazy. Anyway, here they are! I hinted a few weeks ago that I was working on drafting a baby item using Winifred Aldrich's Metric Pattern Cutting for Children's Wear and Babywear. I made it through all the metric conversions and sewed up several self-drafted baby kimono robes this week. 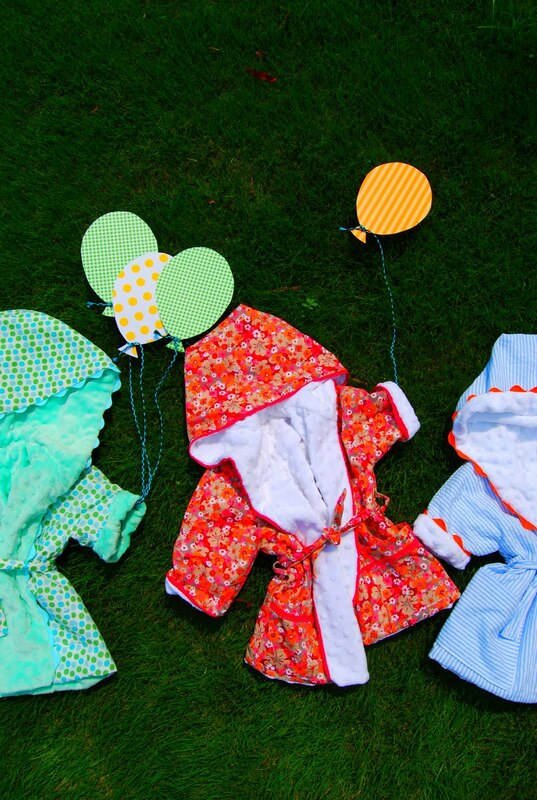 Little baby housecoats, if you will. Now I know these do look similar to the Simplicity baby robe pattern I sewed for a friend at the beginning of the year, but this pattern is different-- very much simplified. 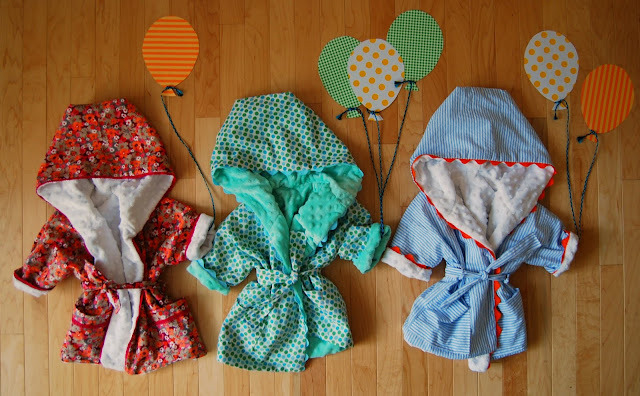 When I initially found that first pattern, I had gone to the store actually looking for a little robe pattern. I did like the pattern. I thought it had some neat features. But it wasn't perfect. For one, I wanted something quick and easy. And lately I've had this twinge where I want to make my own stuff. I've really wanted to try my hand at drafting something completely from scratch. 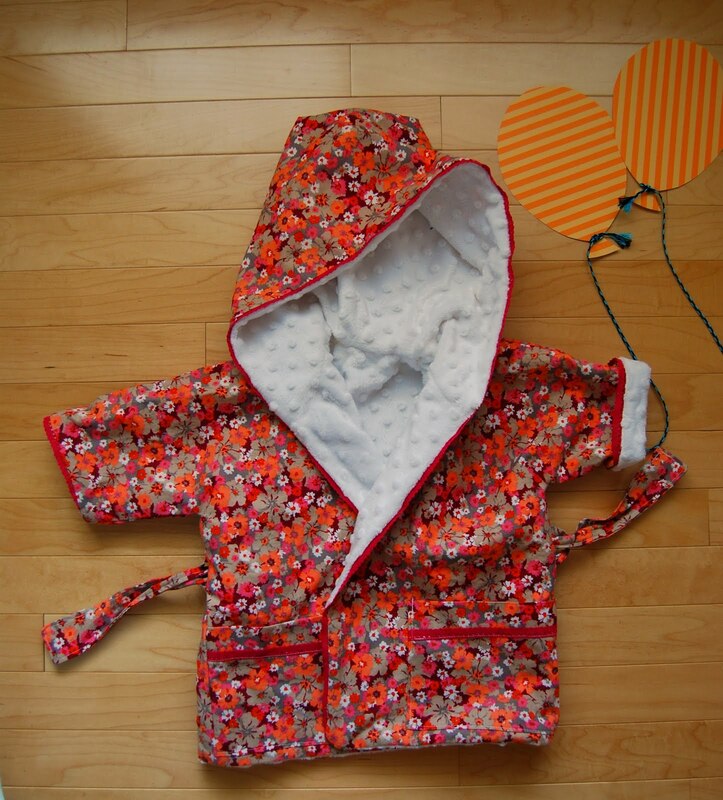 (I actually drafted this pattern before my a-line skirt pattern, though I sewed up my skirts first) I thought this baby robe would be a good starting point because I would have something to compare it to when sewn and also have a self-drafted pattern to make for the numerous babies that are popping up around my group of friends. 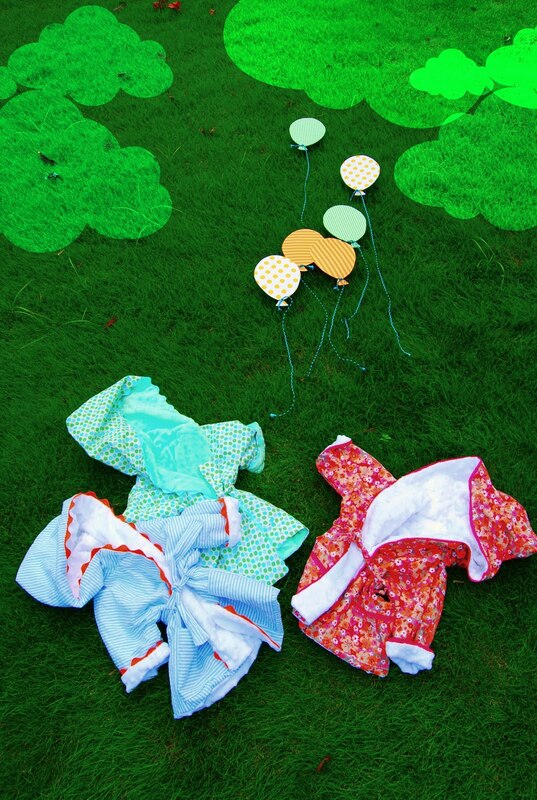 These three little robes already have homes. And I have several more I need to make. 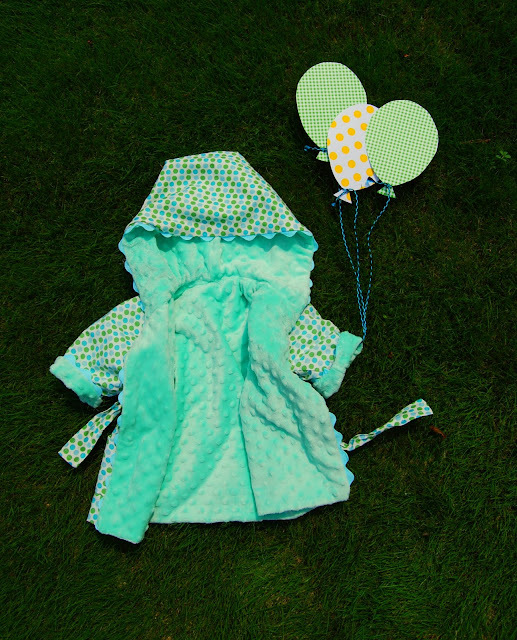 I figure it's a practical but also super cute baby gift. Good for boys and girls. I followed the instructions and drafted the flat woven overgarment block in Aldrich's book. I was generous with the sizing (after I converted it all to inches and pounds- yuck). I wanted it to fit for months, not just a short period of time. I'm estimating that this will fit a baby from 12 to 18 lbs-- maybe, we'll see. I'm borrowing a baby next week to test it out ;) Then, I modified the flat block to have a kimono sleeve. I wanted the robe to have as few pieces as possible. No sleeve to sew in, which seems silly on something so small and shapeless anyway. Aldrich's book is really great. Seriously, there is so much information packed in there it's unbelievable. I learned so much just by reading through the introduction and then trying it out. Pattern pieces above. Start to finish, it takes me two hours to complete a robe. The hood is my favorite part. It's actually one piece- the top is cut on the fold. The back curved seam is sewn first and then the top is sewn like a box corner. Makes for a really cute shape to the hood. I could see some little bear ears put in that seam. I may have to try that on one. Besides the simplified kimono shape and one piece hood, I mega-sized the pocket and added belt loops. The pockets will actually hold something, like a pacifier, and the belt loops keep the belt in place. I did use the technique of inserting ric-rac (or in this case above, lace trim) in to the front seam from the Simplicity pattern. I think it adds so much to the final product. And I love ric-rac. Why is ric-rac mostly used on baby clothes anyway? It was fun to pick out fabrics and trim. I used quilting cotton for the shell and minky for the lining, which is the softest stuff evah! Hopefully the minky will get baby approval. I'm tickled with the finished product. I found the technical aspect of drafting fascinating- which is surprising since I'm no huge fan of math. I'm looking forward to trying out other things. 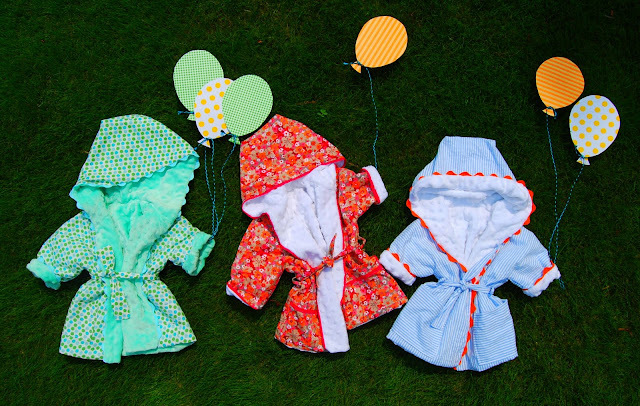 It will be fun to give these little robes as gifts- personalizing them for different friends. And I have the satisfaction of knowing I made it from scratch. Ok, so I may be the last person on the planet to have heard about Picnik. Just in case you haven't either-- check it out. It is seriously the coolest photo editor I've seen. I've been lamenting the fact that I don't have a fancy photo editor for a while now, but no more. Here's me playing around with all the stickers. Also, new blog header a la Picnik. Aaaannnd.... I'm done. I do believe I've made enough skirts now. This is the last installment of my pattern drafting/skirt making adventure known as The Summer of No Pants. I whipped out all the other skirts really fast but this one took quite a bit longer. Too many pieces, I think. And some things were lost in translation on this variation. The fabric is a shirting I bought well over a year ago, so I feel good about using up a stash fabric. And I used every little bit except for a few scraps. These peasant style skirts really use a lot of fabric. I played around with the stripes. I didn't bother matching them where they are on the bias. I figured they change color anyway. Again I used my basic a-line skirt pattern I drafted using Design-It-Yourself Clothes. I cut the a-line skirt pattern shorter and added the two tiers like adding a ruffle, only longer. The ruffle at the very bottom was a last minute addition. I wanted a bit more length. It nearly killed me-- 135 inches of gathering, ruffling, hemming and pinning to match. Yuck. Something is not quite right about the yoke on this particular skirt. I used the yoke piece I drafted on the olive green linen twirly version and subtracted it from the original a-line skirt pattern. In hindsight, I probably should have drafted a new yoke from the a-line pattern. It ended up too wide. I took some of the width out at the side seams but the fit around the waist is not quite right. It sits down quite a bit lower than the other skirts. Can't win em' all. I'll still wear the skirt plenty. It's just not as nice as the others. This little monster on the end of the sofa will show up in many of these pictures. She literally cannot stand it when something new is going on in the house and has to be involved. It's hilarious and also really annoying. You know what they say about curiosity and cats. I'm not too concerned about sewing the cushions other than dealing with pattern matching issues. They're just simple box cushions. It's the frame of the couch that I'm most worried about. We spent a lot of time measuring and documenting how it was put together as we took it apart. And took lots of photos as we took everything off. Double welt at the bottom. Do I piece the bottom panel like this? Or just use one length of fabric? I guess piecing would save some yardage. Upholstery fabric is expensive. She's an expert at being cute. Especially when also being bad. We walked away for a moment and returned only to find her inside of the sofa when we took off the back panel. Check out the old upholstery. An orange and yellow jacquard of some sort. My best guess for year is 1962. The frame seems to be solid pine. Solid and heavy. J is going to repair the wood and glaze it to match the original dark brown stain. We haven't bought the fabric yet, but we are 99% percent sure we've picked it out-- at twenty-two dollars a yard. Suddenly, the twenty-seven dollar sofa becomes much more costly. There's something that I find immensely gratifying about this project. This piece of furniture was not made to be disposable after a few years of use, like some things are nowadays. It was made to last. It was made to be re-upholstered from time to time. There's something satisfying about that. Milton and Geraldine, we're glad to have your sofa. There was no tag anywhere in the sofa when we took it apart. I was hoping there would be, just so I would know a little more about. These numbers and letters are written across the top of the back. Any clue what they mean? Of course 96" is the length. This could have been written whenever it was reupholstered, too. I'm pretty sure that all the springs in the seat back were replaced at that point. They look newer than the seat springs and the burlap from the back of the seat back was missing (I can tell it was there at some point because of the staples). I've learned something about myself today. I am decidedly unable to make a normal face when taking a photo of myself. It's much better if I don't look at the camera. Usually J takes my finished garment photos but I decided to test out the tripod that J's parents recently gave me (thank you!). For some reason, I could not make a normal face no matter how many different photos I took. I snorted out loud while I was sorting through them. Ah well. No top model here. Maybe I'll get better at being natural in front of the camera. It seems to be easier when there's actually someone taking the photo. Something about the blinking light and frantic beeping on self timer mode.... I'd feel like I was looking normal and then at the last second I'd freeze or do something odd. Makes for a good laugh, though! Note the odd faces throughout this post. Moving on to the skirts, now. I tried the slash-and-spread variation from Cal Patch's Design-It-Yourself Clothes using my basic a-line skirt pattern I drafted last week. It basically consists of dividing your pattern into equal-ish sections and spreading them apart to create an exaggerated flare. I have a love/hate relationship with fuller skirts. I love the way full skirts look as a silhouette, but I don't often like them on myself. There's something I don't like about having that extra bulk around my lower waist. I always feel like it makes me appear much larger. Instead of doing the slash-and-spread from the waist line, I decided to to start the flare right at my hip which eliminated the extra bulk in between my waist and hip. Originally I was going to treat the top piece as a yoke, meaning there would be an actual seam where the flare started. But then I thought, why not make it all one piece? I had to do a bit of finagling to turn the two pieces in to one. There's bit of overlap at the side seam and bit more length (a tiny gap when tracing the two pieces together) at the center front and back. But it works. It's the perfect amount of twirly-ness, I do believe. And slimmer just above the hip. Skirt number one is made from more quilting cotton. Hooray for fun prints. Like my basic a-line skirt, I treated the muslin as an underlining on the final skirt. 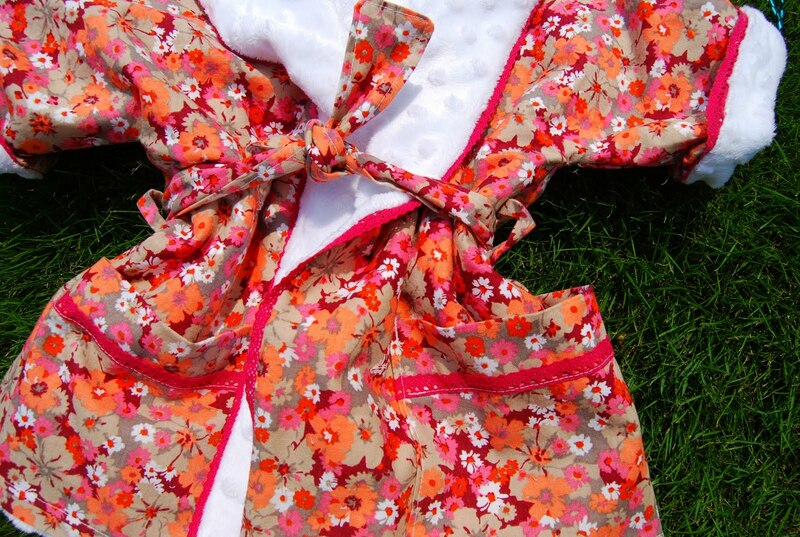 Grosgrain ribbon waist facing. Look out! Giant Liza Jane on the right. For the olive linen version, I drafted a separate curved yoke piece, omitting the darts. I put in some store bought piping to accent the seam (also because it's impossible for me to sew something one drab color). And do I actually need that bright orange lace hem facing there? Nope. But is it pretty? Yep. I've always wanted to use lace hem facing on something. And, check out my successfully not visible invisible zipper. My first time putting one in correctly. I think what put me off the first few times I tried was not pressing the coils forward enough. Sewing during the daylight hours now means I see things a lot better. I don't think I saw how flat the coils should have been on the failed attempts. I also had to press the zipper on a hard surface. My ironing board is too padded to press it flat enough. Skirt number three was just for fun. I bought a beach cover up of some sort from the thrift store because it was about a yard and a half of hot pink linen for a dollar. I laid my basic a-line skirt pattern out and used the ruffle from the original garment at the hem. The patch pockets are a new style called sorta-symmetrical. I had pink and white striped buttons in my stash that match perfectly, but they are just attached for looks. I used one of Lier's pocket tutorials over at Ikat Bag. She has lots of great pocket tutorials as part of series if you are interested. I realized after I finished my skirt that one pocket is slightly wider than the other, but I can't be bothered to fix it right now. Only people who sew will notice. Now, I know that's technically four skirts for the Summer of No Pants Challenge, but I have one more variation in the works. Happy sewing! 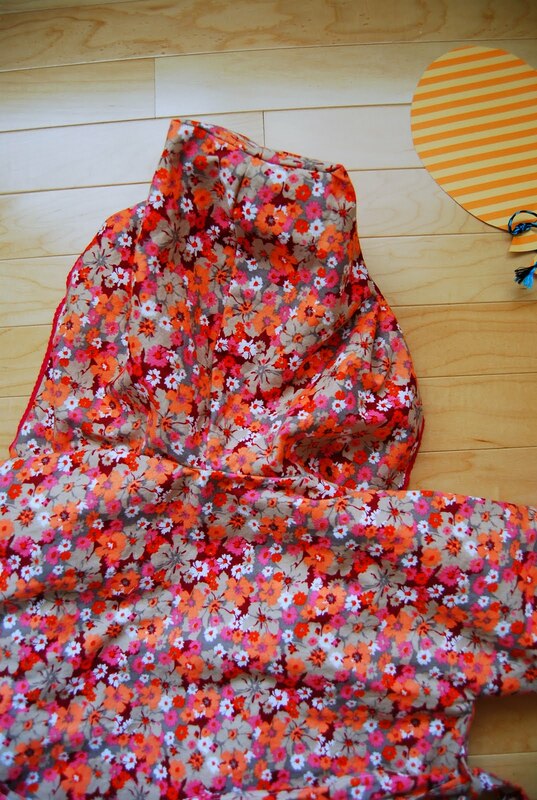 I signed up for Marigold's Summer of No Pants over at Hideous! Dreadful! Stinky! a few weeks ago with full intention of playing along and completing one skirt a week leading up to the first day of summer. I like the idea of a summer with 'no pants' because it gets so stinkin' hot here in the summer months that it is impossible to wear jeans, or any sort of trousers unless they are made from linen. I thought this would be a nice way to beef up my summer skirt collection. Well, life got in the way and I didn't play along until now. But now that I am out of school for the summer (yes, I'm gloating just a little ;) I'm going to try and make my four skirts before the end of next week. Here's the first. I know it doesn't look special, but this skirt is self-drafted. I feel fancy just typing that. I mentioned in the last post that I was using Aldrich's Metric Pattern Cutting for Children's Wear to work on a pattern for a baby item, but I also decided to have a go at drafting something for myself. This time I used Cal Patch's Design-It-Yourself Clothes. This book presents pattern drafting for a few simple blocks- the a-line skirt, a knit top, a woven shirt, pants and others- and then tells you how to modify your existing block to make all sorts of variations. I like that the information is presented in such a way that if you are a complete pattern drafting beginner, like myself, you can make a successful first self-drafted project. I still want to order Winifred Aldrich's Metric Pattern Cutting for Womenswear for more options, but this book is a good starting point for newbies. I obviously started with the basic a-line skirt. I've lived an entire life of wearing skirts that don't exactly fit right. Either too tight across the hips or gaping at the waist. Time to make a simple skirt that fits properly, don't you think? I think the chapter in the book that deals with taking your own measurements is the most invaluable. I gave myself a pep talk in the mirror (your measurements ain't nothin' but a number, LJ) and put vanity aside when I took my hip measurement. Hip measurement in the book is defined as your widest part, which may be lower than you think. Yes, let's just say my widest part is a bit lower than I thought. I blame gravity. And my general laziness when it comes to working out. I also took my waist measurement by where I actually wanted the waistline of my skirt to sit. I often note my waist measurement by my natural waist, but generally don't wear things at my natural waist. The other measurement that was key was the waist-to-hip measurement, which I did with two tape measures. Not sure what this look is all about. The result, my friends, is a pretty darn awesome-fitting skirt, if I do say so myself. I was really pleased with myself. I told my husband that I thought it was pretty amazing that I made up a pattern and sewed an a-line skirt for myself in one day. To which he replied, modest, aren't we? The blue fabric is actually my original muslin for the skirt pattern. The only tweak I made after sewing up the muslin was to widen the front darts by 1/4". It made the front fit better at the waist. And it brought up the hemline in the front some which usually tends to droop a bit lower than the back hem. Why is that? Do I need more length on the back piece? More width for booty? I should do a little research to figure that one out. I used the original muslin as a sort of underlining for the finished skirt. I used quilting cotton, too. 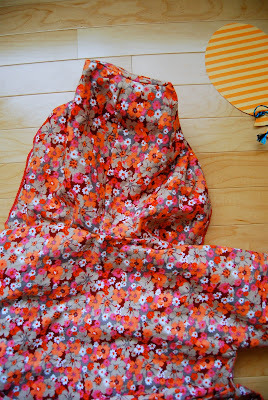 I know that's a no-no most of the time but I don't have a problem with using quilting cotton for a simple summer skirt. The blue fabric gave it a bit more bulk and stiffness than just a single layer of cotton. I also used a grosgrain ribbon as a waist facing to stabilize the waistline. The whole thing feels a bit more substantial than an average quilting cotton skirt. I, once again, failed at the invisible zipper step and put in a regular exposed teeth zip. I will put one in right soon. I'm determined. Well, I'm off to sew more skirts! I'm doing a fun slash-and-spread variation as we speak- sounds positively evil, doesn't it?